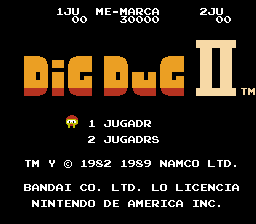 Dig Dug II is an action game for the Nintendo Entertainment System. 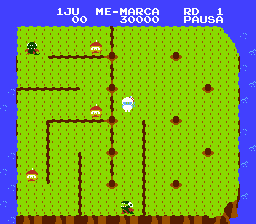 This is the sequel to the original Dig Dug. Unlike the original game, this one takes place on several islands. The goal is the same however, to destroy all of the enemies in the current stage. Scattered throughout the island are fault lines and holes. Dig Dug can drill in holes to create a fault line along the ground. Any ground fully surrounded by fault lines will cause it to fall into the sea and anything on that ground will drown. 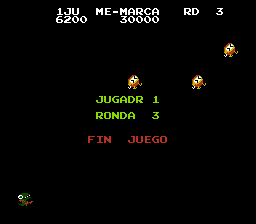 Both Pookas and Frygars have returned and Dig Dug uses the same inflation method to dispose of them. 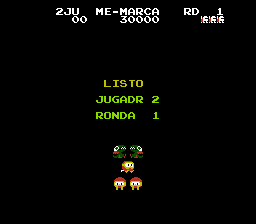 Translation to Spanish for “Dig Dug II: Trouble in Paradise” for the NES.